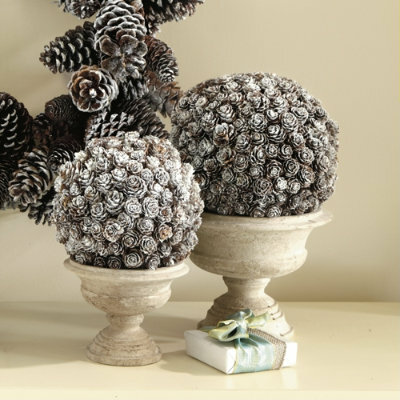 I saw these pine cone topiaries on Ballard Designs and thought they were so pretty, but knew I could recreate one for a lot less! Even thought it was really easy to do, it was definitely time consuming, it took two nights to finish, but I just worked on it while I watched TV with the hubs. It also took way more pine cones than I thought, so I ended up only making one. 1. 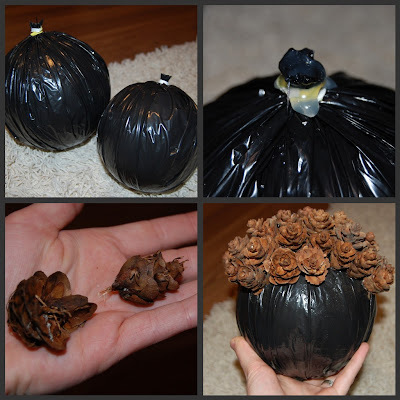 Wrap a black garbage sack around your styrofoam ball, twist the bag tight and tie it off with a twisty tie. Cut off the extra plastic from bag. This will keep the white from peeking through and help the pine cones adhere better. 2. Drench the tied end in hot glue to keep it from coming undone. 3. Grab the middle of the pine cone, and twist the bottom to create a "smaller" pine cone. Get rid of the bottom, you'll only use the top. Make sure all your tops are about the same size to get a symmetrical ball. 4. Hot glue your pine cones onto the covered ball, starting at the top and working your way down until the whole ball is covered. 5. Lightly spray paint with white or silver spray paint, I used white. I got the planter at Hobby Lobby, it was $7.99, but it was half off, sweet deal! If you're not as lucky as me to have a Mom do the dirty work for you, or if you don't live in the Northwest, Michael's has some pre-painted smaller pine cones in bags in the floral section. I love this project because I can keep it up all winter! Gorgeous! What a beautiful idea! Beautiful, they turned out great! I want to make one! Love love love this!!! I have a ton of pine cones just waiting for a project...I think I found it!!! Thanks for sharing! That is so cute! Makes me wish I had pine trees around too! It's linky party time again! I hope to have you come link up and enter my $50 american Express giveaway! Happy holidays! Wow!!! So easy and so pretty! what a pretty topiary! I love it, and my kids love collecting pine cones. Thanks for linking up to Topsy Turvy Tuesday's! I am bookmarking this for sure!! As soon as the snow melts enough for me to find the pine cones I will be gathering some for this project. Did you display yours indoors or outdoors? TEKM, I kept mine indoors, when the pinecones get wet, they swell shut. If you collect yours after your snow melts, a good way to dry them out so they open up is to put them on cookie sheet covered with foil and stick them in the oven on warm until they open! Megan, I love this project. I'd like to use it in a round up of crafts that can be made with kids for holiday gifts. The post would be published on TLC's Parentables.com website. May I have your permission to use a photo and link back to you?